Remember last Thursday when I shared the armchair makeover with serious attitude? At the bottom of that post I mentioned that I should make a pillow with the leftover fabric and embroider the words, For Looks Only. Well, I made that pillow and I'm sharing it with you today. If you missed that hair pulling, cuss word spewing, wine drinking saga you can catch it here at The Armchair Makeover From Hell. The first thing I did was make a graphic in PicMonkey and reversed the image so I had a mirror image. Several months ago I bought some Lesley Riley TAP (Transfer Art Paper). What I didn't realize is that you need to use it with an inkjet printer and mine is a color laser. Santa a.k.a. Mr. Frugalista bought me an inkjet printer for Christmas. I asked for a Cameo Silhouette so you can imagine my inner excitement when I saw the wrapped box under the tree. You can imagine my inner disappointment when I unwrapped that said box. Thanks to this pillow, I finally set up that new inkjet printer and got to play with my package of TAP. Let's just say, Lesley Riley is my new best friend. 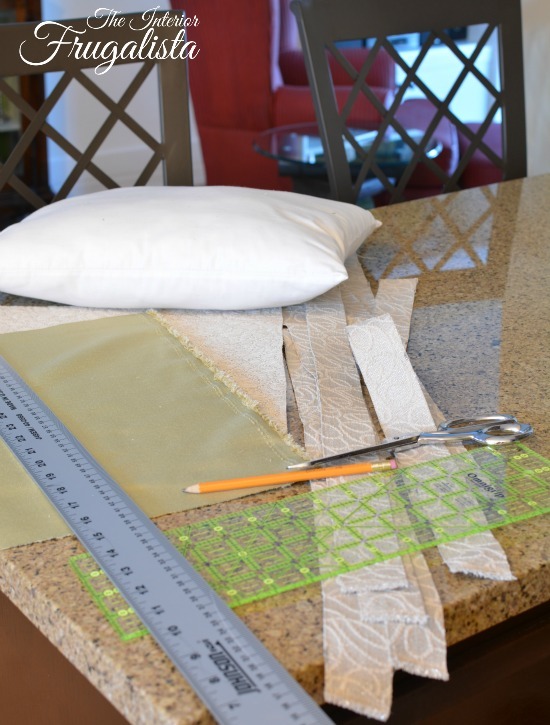 Cut the fabric the same size as the pillow form (for a full pillow I recommend you don't add a seam allowance). 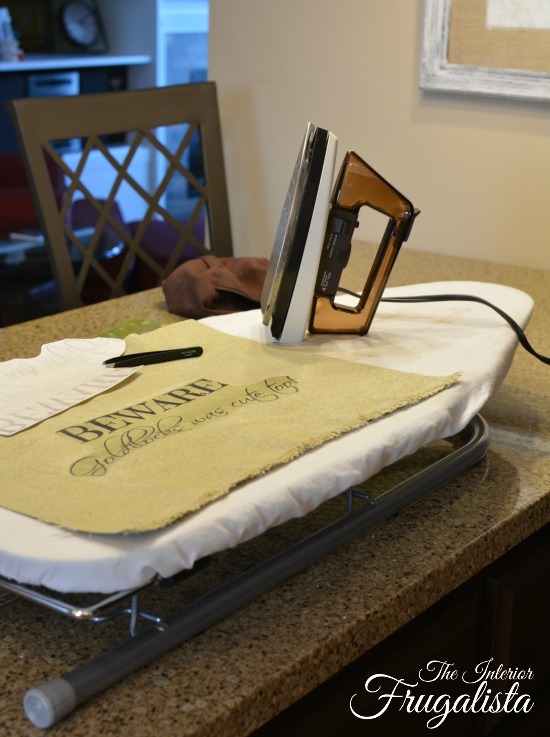 Iron the TAP paper (image side down) onto the good side of the pillow with the Dry (no steam) High Heat setting. If the fabric has a sheen, place a 100% cotton dish cloth over the fabric and added extra ironing time to ensure a good bond. 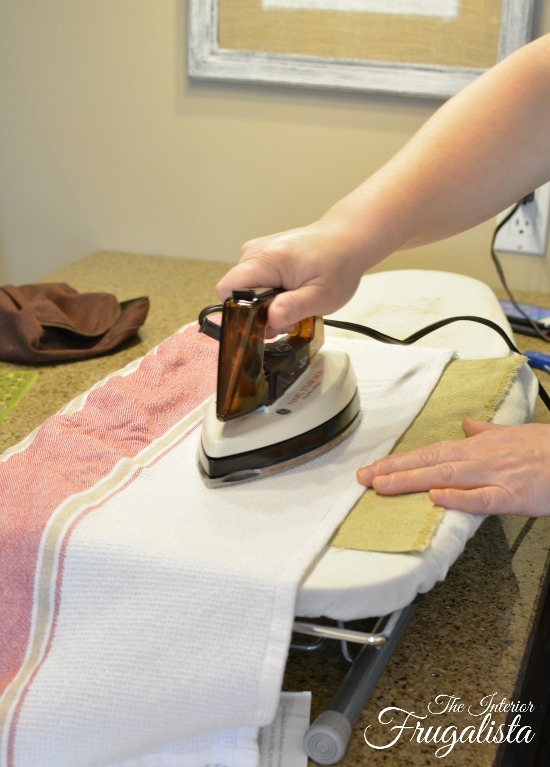 I keep a table top ironing board and travel iron handy in my sewing room. 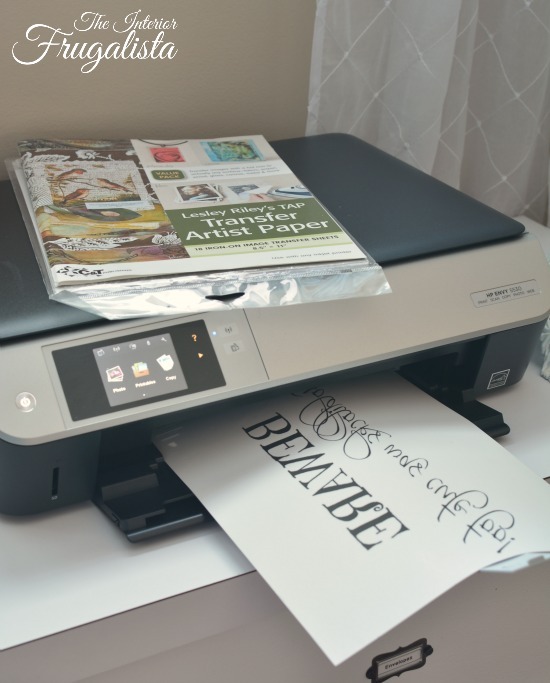 The paper will be hot to the touch so I recommend using tweezers to remove the Transfer Art Paper. I saved the oops piping from the armchair to reuse on the pillow, or rather I thought I did. When I happily trotted downstairs to my fabric bin, I gasped when it wasn't there. A quick text to Mr. Frugalista confirmed that he threw it out. HE THREW IT OUT people - perfectly good and reusable piping went to the landfill. Don't tell the recycle police because he brings me flowers...and he cooks most of the meals...and he cleans toilets. So I calmed myself down and got to the task of making new piping with the one piece of fabric I had left along with clothesline cord. 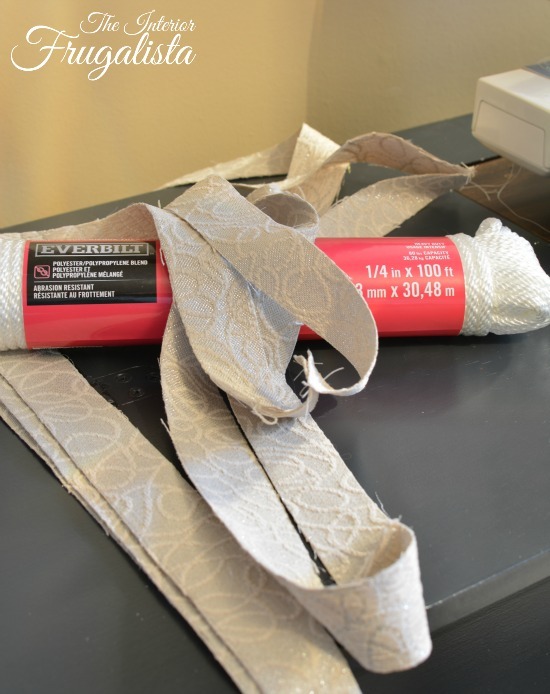 To make piping you fold the 1 1/4-inch wide strip of fabric in half (good side facing out) over the clothesline cord and using a zipper foot on the sewing machine, stitch as close as you can to the cording. If you have more advanced sewing skills you can skip this step and move onto the next one. Otherwise, for those with novice sewing skills like myself, we are going to sew the piping onto the pillow back first before stitching the pillow together. With the good side of the fabric facing you, pin the piping with the raw edges of the seam allowance lined up to the raw edge of the pillow fabric. Sew the piping onto the pillow back going over the same stitch on the piping. I apologize for not having pictures of this step. Pin the good sides of the front and back pieces together. Sew them together, leaving a 6-inch opening on the bottom to insert the pillow form. Turn the pillow right side out and use the end of a wooden spoon to push the corners out. 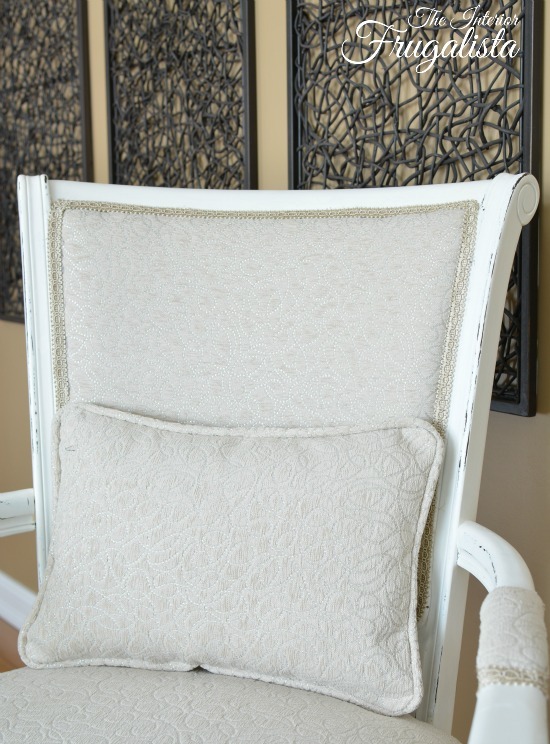 Slip the pillow form into the 6-inch opening and pin closed. Hand stitch the opening closed or if you're brave, stitch it closed with the sewing machine. 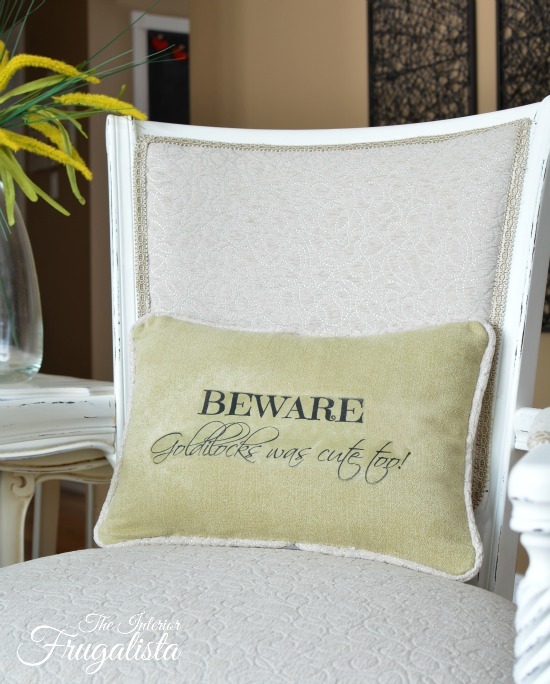 Voila, a Sassy Pillow for the Armchair with serious attitude. When I don't want a sassy vibe on the chair, I'll flip the pillow over. Who am I kidding, I'm a sassy kinda gal so it won't be flipped often - only when serious guests come to visit. If you enjoyed this Sassy Pillow, please share it with a friend and/or save it on Pinterest. 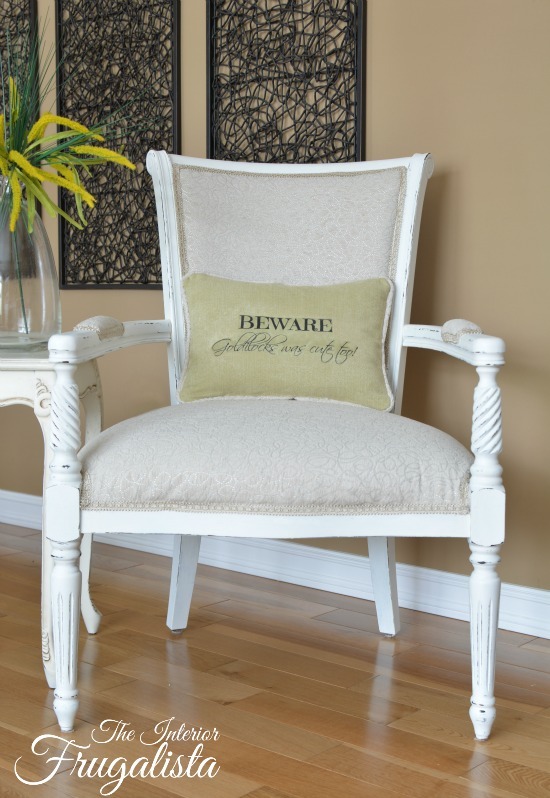 If you ever come over for coffee or a glass of wine, you've been forewarned about the armchair from hell.